Spearmint herb or garden mint or common mint has long been reputed for its characteristic aroma it imparts to the recipes it added to. The least pungent and subtle among the species of mint family, this unique herb is one of chef’s main culinary favorites. Mint herb botanically belongs to the family of Lamiaceae, of the genus: Mentha. Scientific name: Mentha spicata. The plant is a branching perennial herb of Mediterranean origin. It is widely used across Europe and in large parts of Asia and Africa in flavored drinks, salads and confectionary and as a garnish to recipes. The herb grows easily in fertile, moist and loose soil with underground runners. In general, the divisions are planted to propagate. The plant reaches about 75 cm in height, and bears oppositely arranged leaves all along the thick square stem. The leaves are deep green, deeply-veined, oval shape with pointed ends and serrated margins. Slim pointed spikes of mauve flowers appear during late summer. There are at least 20 species of mint and their hybrids exist, most of them difficult to classify because of their variability and readiness to hybridize among each other. Spearmint is pleasantly aromatic herb packed with numerous health benefiting vitamins, antioxidants and phyto-nutrients. The leaves and herb parts contain essential oil, menthol. 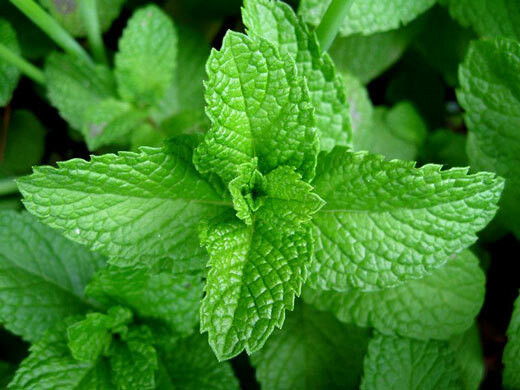 Unlike in peppermint, spearmint leaves composes only small amounts of menthol, 0.5% compared to the 40% in peppermint. Less menthol content would make this herb least pungent and subtly fragrant herb in the mint family. The herb has low calories (about 43 calories per 100 g) and contains zero cholesterol. The chief essential oil in spearmint is menthol. Other important chemical components of spearmint are α-pinene, β-pinene, carvone, cineole, linalool, limonene, myrcene and caryophyllene. These compounds in mint help relieve fatigue and stress. The herb parts are also very good in minerals like potassium, calcium, manganese, iron (148% of RDA), and magnesium. Iron is required for enzymes in cellular metabolism and synthesis of hemoglobin. Potassium is an important component of cell and body fluids that helps control heart rate and blood pressure. Manganese is used by the body as a co-factor for the antioxidant enzyme superoxide dismutase. Further, the herb is also rich in many antioxidant vitamins, including vitamin A (provides 4054 IU or 135% of RDA), beta-carotene, vitamin C, folates (26% of RDA), vitamin B-6 (pyridoxine), riboflavin and thiamin. Almost all parts of spear mint herb found a place in various traditional as well in modern medicine. »» The herb deconcotion is an excellent remedy for minor ailments such as headaches, nervous strain, fatigue and stress, as well as for the respiratory problems; helping with asthma, bronchitis and catarrh. »» It is very useful to deal with digestive problems, including nausea, flatulence and hiccups as it relaxes the stomach muscles. »» The essential oil, menthol, has analgesic, local anaesthetic and counterirritant properties. »» Menthol also found application in the preparation of toothpaste and mouth refreshers. »» On the skin, when used as cream or lotion, it may help relieve the itching of pruritis, dermatitis, and hives. »» Spearmint oil is used as blended massage oil and in the aromatic therapy to help relieve headaches, stress, fatigue, and nervous conditions and to relieve itching. »» Spearmint tea can be used safely in pregnancy. In women, it helps reduce unwanted hairs through its anti-androgenic properties.